In the fall, I love baking with apples. In Canada, it’s almost Thanksgiving, and with company coming this year I was looking for a new recipe that isn’t too sweet and puts the emphasis on the apples. I happened on a recipe for French Apple Cake that really appealed to me. I love simple, rustic French food, and not only did this recipe sound great but it looked easy, which is even more important, so I thought I’d give it a try. 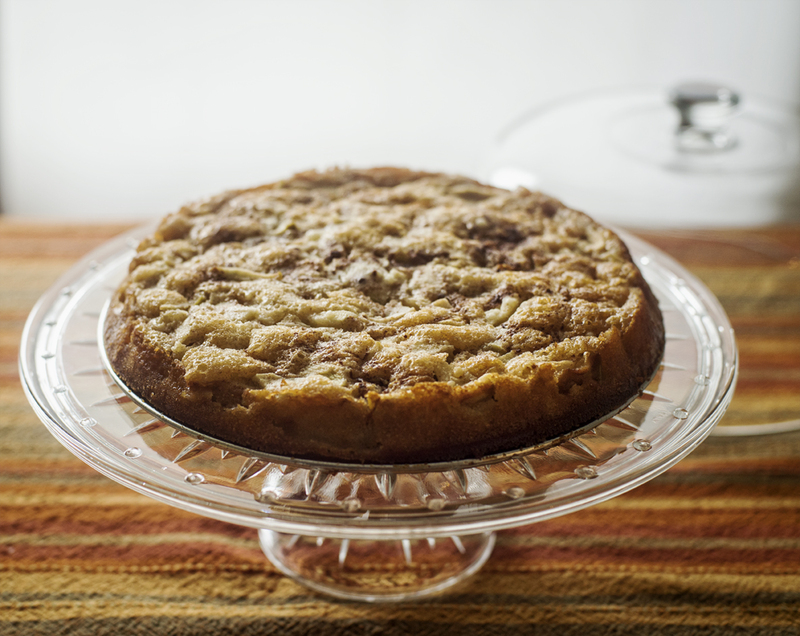 This dessert has a custardy, apple-rich base beneath a light, cakelike topping. Cook’s Illustrated recommends microwaving the apples briefly to break the enzyme responsible for firming up pectin. I followed that suggestion and it worked really well. This cake goes really well with a light dusting of powdered sugar, whipped cream, ice cream but it’s also lovely by itself — and tastes just as good the next day or the day after, in the unlikely event that anything is left. 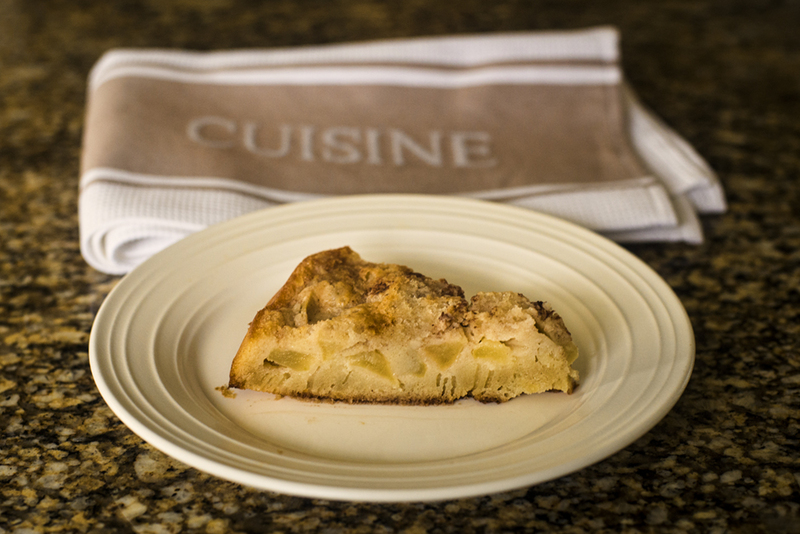 If you like apples or French food — or both — you might want to give this a try! 1. Adjust oven rack to lower-middle position and heat oven to 325 degrees. Spray 9-inch springform pan with vegetable oil spray. Place prepared pan on rimmed baking sheet lined with aluminum foil. Place apple slices into microwave-safe pie plate, cover, and microwave until apples are pliable and slightly translucent, about 3 minutes. Toss apple slices with rum and lemon juice and let cool for 15 minutes. 2. Whisk 1 cup flour, 1 cup granulated sugar, baking powder, and salt together in bowl. Whisk egg, oil, milk, and vanilla together in second bowl until smooth. Add dry ingredients to wet ingredients and whisk until just combined. Transfer 1 cup batter to separate bowl and set aside. 3. Add egg yolks to remaining batter and whisk to combine. Using spatula, gently fold in cooled apples. Transfer batter to prepared pan; using offset spatula, spread batter evenly to pan edges, gently pressing on apples to create even, compact layer, and smooth surface. 4. Whisk remaining 2 tablespoons flour into reserved batter. Pour over batter in pan and spread batter evenly to pan edges and smooth surface. Sprinkle remaining 1 tablespoon granulated sugar evenly over cake. 5. Bake until center of cake is set, toothpick inserted in center comes out clean, and top is golden brown, about 1 to 1¼ hours. Transfer pan to wire rack; let cool for 5 minutes. Run paring knife around sides of pan and let cool completely, 2 to 3 hours. Dust lightly with confectioners’ sugar, if desired, then cut into wedges, and serve. Note: The microwaved apples should be pliable but not completely soft when cooked. To test for doneness, take one apple slice and try to bend it. If it snaps in half, it’s too firm; microwave it for an additional 30 seconds and test again. Adapted from a Cook’s Illustrated recipe. Pat, you could simply soften the apples in a pan on the stove with a little rum and coconut oil would work but I would cut the quantity down some…cheers! I don’t own a microwave so option might be?? I adore baking…but for some reason my thighs don’t agree with me! Could you send me a piece? The custardy part hooked me too Diane. If you do make it, let me know how you like it! Apparently this came from an old French recipe, Sandra. And chefs like Dorie Greenspon in Paris have their own versions too. Thanks for popping in. not only are your photographs so professional but I am hooked by your description of this cake. As soon as you mentioned, “custardy” you had me. Thank you for sharing the recipe with us. I’m definitely going to make it! This cake looks absolutely delicious, Sherry. I wonder why it’s called French? I haven’t ever tried gluten free flour so not sure how it works. Hope you like the recipe, Cheryl! Great, Laurie, hope you like it! That’s wonderful to have a good crop of apples. Our espaliered trees did not produce well this year. Melinda, I did use the rum, but you can easily omit or use brandy. Enjoy! I’m saving this recipe- it sounds wonderful! Also wondering if you used the rum. . .
Sherry I love recipes for all the same reasons you do…but mostly for the ease of them…I also love anything French…so this is right up my alley…and you presented it so lovely…I’m going to try it also but I’m going to try a gluten free version so my son can enjoy it with us…we’ve all gotten very use to using gluten free flour here.. I’ll give you a report on how it came out…Thanks so much for sharing..
Did you use the optional rum? Delicious warm with a scoop of vanilla ice cream ! This looks great, Sherry, thanks! We’ve had a good apple crop this year so I’ll give it a try in near future. I’m always on the lookout for recipes that take chopped apples rather than applesauce, so this is appreciated. Oh my, that looks delicious. I am going to try the recipe when we get home.